In 2006, Amalfi Semiconductor, Inc., hired “Sally” as its financial administrator. At the time, Amalfi was a startup research and development company with 30 to 40 employees. Sally holds a degree in management accounting but is not a certified public accountant (CPA). She received favorable performance reviews, promotions, and performance-based raises during her employment at Amalfi. Over time, Amalfi evolved, grew in size, and added manufacturing and sales operations. The company hired its first full-time chief financial officer (CFO) and controller, both of whom believed it needed to hire a CPA to ensure its accounting was accurate and complied with generally accepted accounting principles (GAAP). The controller believed that Sally was not capable of performing those functions. On May 4, 2011, Amalfi hired 33-year-old “Lisa” as its accounting manager. Lisa holds a bachelor of science degree, a master of business administration degree, and a CPA license and has worked for international accounting firms. Moreover, she speaks Mandarin, which Amalfi asserted was important because a majority of its customers and suppliers are Mandarin-speaking and it was planning to open a Shanghai operation. Amalfi hired Lisa at a higher salary than Sally was earning and assigned her job duties different from Sally’s, including duties that were previously performed by the controller. Sally allegedly spent more than two weeks training Lisa. Later that month, Amalfi conducted a RIF, eliminating several jobs, including Sally’s financial administrator position. At the time of her termination, Sally was 59. Sally sued Amalfi for age discrimination in violation of California’s Fair Employment and Housing Act (FEHA). The trial court granted Amalfi’s motion for summary judgment, ruLisag that it provided a legitimate nondiscriminatory reason for terminating Sally and she failed to show that its reason was false or a pretext for unlawful age discrimination. The court of appeal affirmed the decision. 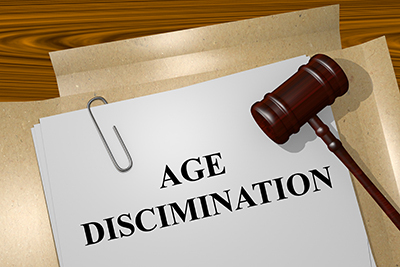 The FEHA makes it unlawful for an employer to base adverse employment decisions on age. An employee has the initial burden of establishing facts to support a discrimination claim. To meet that burden, she must submit evidence establishing a prima facie (minimally sufficient) case, including proof that she (1) is older than 40, (2) suffered an adverse employment action, (3) was performing her job satisfactorily, and (4) suffered the adverse action under circumstances suggesting unlawful discrimination (i.e., she was replaced by a significantly younger worker). The employer may rebut the employee’s prima facie case by articulating a legitimate nondiscriminatory reason for its actions. The burden then shifts back to the employee to prove that the employer’s reason is pretextual, and there is a triable issue as to whether her age formed the basis for the adverse action. It is not enough to show that the employer’s decision was wrong, mistaken, or unwise; the employer must have been motivated by unlawful discrimination. On appeal, Sally argued that Amalfi terminated her because of her age and hired the significantly younger Lisa as her replacement, thus creating a prima facie inference of age discrimination. The court of appeal disagreed. Amalfi did not hire Lisa to do Sally’s job. To the contrary, Amalfi was a growing company and its expansion necessitated the hiring of someone with a sophisticated understanding of accounting principles. It needed a CPA who could, among other things, ensure that its financial statements complied with GAAP and could serve as the basis for an outside audit, and it wanted its accounting practices more professionally documented for potential investors. Sally lacked the training and expertise to accomplish those goals. Amalfi hired Lisa for the newly created accounting manager position at a higher salary level than Sally, expecting her to perform many duties that differed from those performed by the financial administrator. Sally herself admitted that most of Lisa’s duties were functions that she did not consider part of her job, but rather were part of the controller’s job. Sally sought to diminish Lisa’s qualifications and minimize the level of sophistication of her work. But the ultimate wisdom of Amalfi’s decision to hire Lisa for the new position was irrelevant because Sally could not successfully refute that Lisa (1) had significant accounting and language expertise that she lacked, (2) performed work that differed from the work she performed as financial administrator, and (3) performed tasks that she did not believe were part of her job description. In effect, Sally was not replaced by Lisa. The court of appeal went a step further in its analysis, pointing out that even if Amalfi had replaced Sally with Lisa, it had articulated credible nondiscriminatory reasons for its decision, and Sally failed to present sufficient evidence to prove that its motives were discriminatory. Lisa had more knowledge and expertise than Sally, and could perform the higher-level accounting functions the company needed, functions that Sally could not perform and was not providing as financial administrator. Furthermore, once Lisa came on board, it was apparent that she could devote a small amount of her work time performing or delegating the necessary financial administrator tasks, making Sally’s position redundant. Sally argued that Amalfi’s hiring decisions were inconsistent. In particular, it was not credible that the company would hire Lisa because of an increase in work but simultaneously terminate her as part of a RIF. But the company decided to hire an accounting manager to help oversee the complex accounting functions that accompanied its new manufacturing and sales activity. The court acknowledged that Amalfi may not have handled Sally’s termination in the most straightforward manner, but its rationale for the decision belied the assertion that its actions were discriminatory. Finally, the court of appeal rejected Sally’s claim that Amalfi had engaged in a pattern and practice of age discrimination. She admitted there had not been any ageist comments in the workplace. And even though the company had recently hired the CFO, the controller, and Lisa, all of whom were younger than 40, those jobs were newly created. Moreover, just because all three employees laid off in the RIF were older than 40, the sample size (three employees from a pool of approximately 110) was too small to imply a discriminatory pattern. Shasby v. Amalfi Semiconductor, Inc. (California Court of Appeal), 6th Appellate District, 1/30/18 (unpublished). If you decide to terminate an at-will employee who is a member of a protected class, you should first assess and document the legitimate nondiscriminatory business reasons for your action. Here, Amalfi defeated Sally’s age discrimination claim because it was able to prove that it did not replace her with a younger worker, but rather hired a more skilled worker who rendered her position redundant. Thus, discriminatory animus was not the motivating factor behind Amalfi’s actions.